As New York City approaches the ninth anniversary of the 9/11 terrorist attacks, the Godwin-Ternbach Museum at Queens College will present a "September 11 Memorial Installation." In the piece, Ng, who studied at Wartburg College and the Rhode Island School of Design, has taken different items and transformed them. For instance, bleeding lines were made out of the red stripes of the American flag to symbolize the blood of the victims. Some Chinese elements that were incorporated are a bowl filled with rice and two chopsticks. The rice can be a sacrificial offering for those who have passed away, while the chopsticks resemble the Twin Towers. The installation also includes an audio track that plays a Buddhist prayer for salvation. Ng's piece is part of a red, white and blue three-part installation. His piece presents red. The other two parts are on display at the Aljira Contemporary Art Center in Newark, NJ and the Museum of Chinese in America in Manhattan. "Chee Wang Ng is a deeply reflective artist whose knowledge of Chinese culture and symbolism has revealed itself in thought-provoking artworks over the years,” said Godwin-Ternbach Museum director Amy Winter. "His leitmotif of the bowl of rice has repeatedly served different themes, presented in mixed-media installations of photography, video, sound and sometimes painted or drawn form." The installation of Ng’s work is part of Queens College’s “Year of China.” The programming will also include the exhibition “Eden: Ceramics by Sin-Ying Ho” at the Queens College Art Center from September 8 to October 26. A reception and artist talk for it will be held from 5 to 8 p.m. on Wednesday, September 15. Another exhibit, “Marlene Tseng Yu: Nature and Cosmos,” will open at the Godwin-Ternbach Museum on September 13 and will remain on display through November 24. There will also be performances, lectures and other programs. A complete list is available at www.qc.cuny.edu/yearofchina. 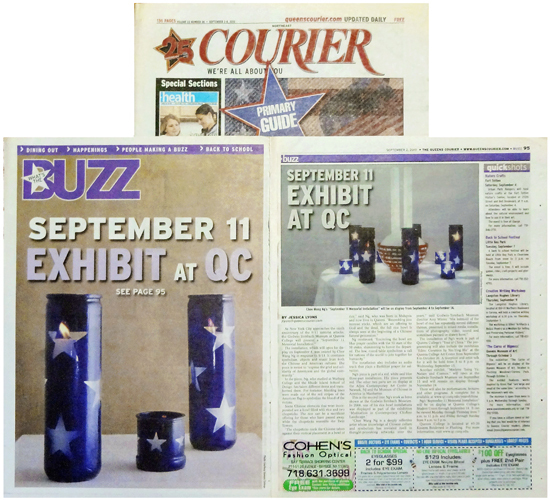 Ng’s “September 11 Memorial Installation” will be on display at Queens College’s Student Union through September 14. It can be viewed Monday through Thursday from 7 a.m. to 11 p.m. and Friday through Sunday from 9 a.m. to 5 p.m.
Queens College is located at 65-30 Kissena Boulevard in Flushing. For more information, visit www.qc.cuny.edu.